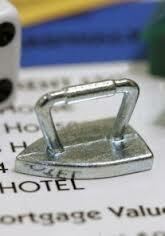 Monopoly players have said good-bye to the iron, welcoming a cat as the new player piece. As kids growing up in the 1950s, my sisters and I played Monopoly often, and I have to admit, I don’t think any of us ever chose the iron. My personal favorite was the shoe. Still, the iron performed a central role in our lives. Washing on Monday. Ironing on Tuesday. I learned to iron, as many girls did, bringing wrinkle-free order to stacks of handkerchiefs. Ironing was so integral to the week that I devoted a chapter to it in my memoir Growing Up Country. 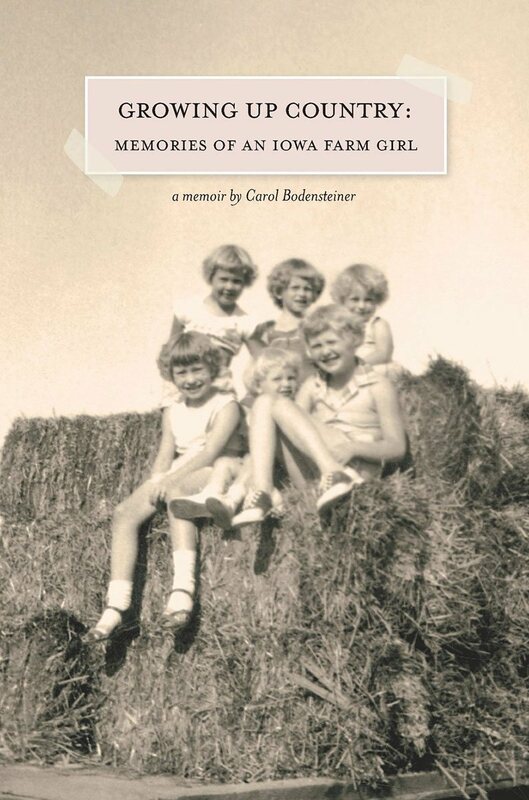 Since publishing this memoir, I’ve learned that laundry and ironing hold almost as many memories for rural women as taking care of chickens. And that’s saying something. When Grandma Jensen came to stay with us, which she did every summer, she took over ironing chores. She ironed hankies, too, but not her own. Each night she washed her own hanky in the bathroom sink and plastered it on the screen of the bedroom window to dry. 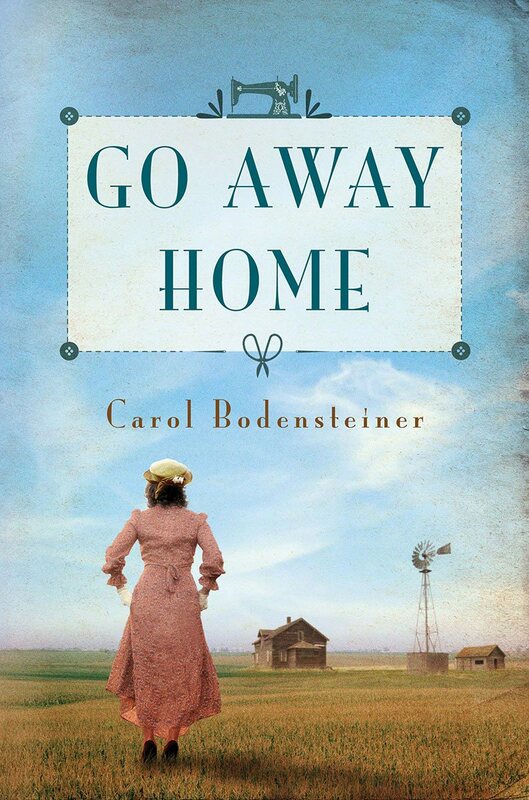 In the morning, Grandma donned one of the cotton shirtwaist dresses she wore every day. She pulled on nylons, rolling them down to just above her knees, and covered her pure white hair with a silver net. Finally, she plucked the now-dry hanky from the window screen, folded it and put in in her pocket. 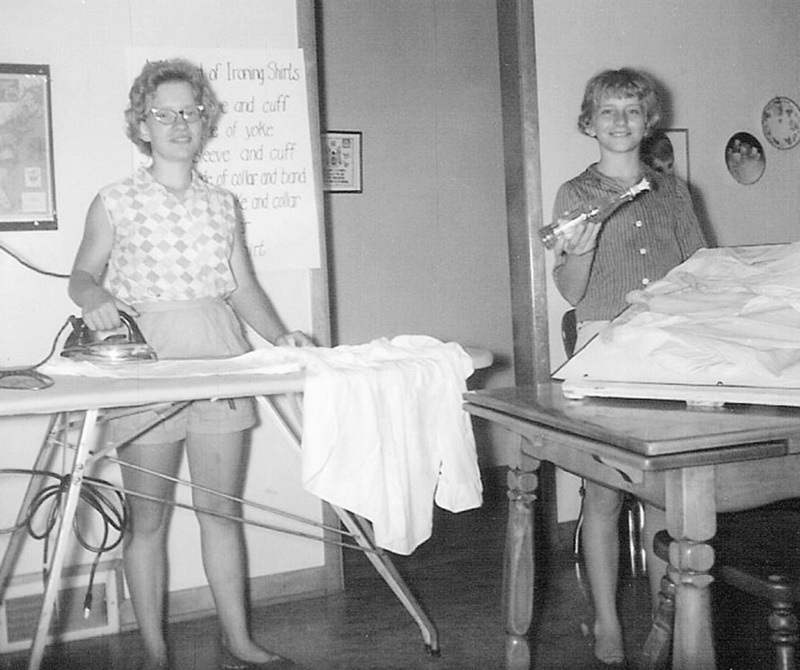 When Jane and I took on the 4-H shirt ironing demonstration – and for one summer claimed squatter’s rights at the ironing board – I can only imagine what Grandma thought. As tedious as the hours of ironing could be, they were also the hours when Grandma watched ‘her shows’ as Mom always called the soaps. A dedicated follower of the perpetual heartaches and never-ending trials of Search for Tomorrow, Guiding Light and As The World Turns, Grandma set the ironing board up in front of the TV in the living room and tackled the ironing while she caught up on the day’s stories. Piece by piece, she drew shirts and pillowcases and hankies and dresses from the laundry basket, stretched them on the ironing board, flicked water with her fingertips and eliminated wrinkles in our clothes while the characters in her dramas solved the problems in their lives. Every week the basket of ironing was full again with the same laundry; every week the soaps offered the same problems to be solved. Because of Grandma, the hopelessness of soap operas and the never-ending challenge of laundry are tied together forever in my mind. I’d be with your Grandma with regard to ironing in front of the TV. I learned to iron from my mam. I actually like ironing. That said, I find it best enjoyed infrequently and in short bursts. Good point, David! A little ironing can go a long ways. I was just reminded of the smell of the iron’s heat against damp cloth. I liked that. i learned ironing cloth napkins in italy… it was the only thing my grandmother would allow me to practice on. and you are so right, we played monopoli quite a bit, even in italy, and i don’t ever remember chosing the iron. will any one really miss it? Your cloth napkins were akin to our hankies, Annamaria. The only thing Mom was willing to sacrifice to our learning this necessary skill. Though I did love the shoe, with the cat as an option, I might have chosen it. I’m a real cat person. I remember my mom ironing for hours every week. I kinda liked it — watching the wrinkles disappear, replaced by a beautifully smooth fabric. But if I had to do that for hours a week? No thanks! The famous essay by Tillie Olsen, “I Stand Here Ironing,” comes to mind. Love the vignette that links ironing to the soaps. Also, the details. Did she have a recycled ketchup bottle, filled with water and a sprinkler top? Or did she sprinkle and then freeze the clothes to keep moisture in them when she ironed? I’ve read that essay, Shirley, but I need to look at it again. Grandma used her fingertips to flick water from an aluminum sauce pan on to the clothes when she needed a bit more damp. But we had plastic bags full of damp clothes in the refrigerator. That ensured they were evenly damp and stayed that way until she was ready for them. My grandma still had the flatiron she inherited from her mother and used to tell us how she’d heat it up on the wood-burning stovetop. She said the house smelled like starch — from potato water — for days if they had a wedding or funeral to go to. She usually didn’t bother for church. It was my favorite Monopoly token, too. Like the race car, it had a real use; unlike a metal cat: totally useless. What a treasure. Do you still have the flatiron? I hadn’t thought about potato water for starch but now that I think about it, that would certainly work. All of the tokens that I can remember had a practical use – even the top hat, though that wouldn’t have been used by anyone in my social circle. I wonder if the cat signals a shift in our society to leisure??? 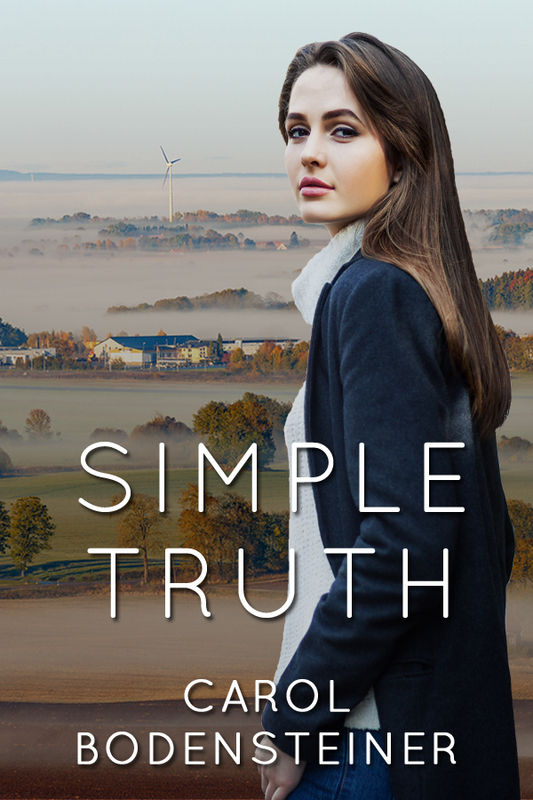 I like the Laundry Lessons chapter in your book – especially the part where you and your sister did the ironing demo at the state fair. I shared your frustration! I also iron rarely, collecting a pile and then ironing while watching TV or a DVD, about the only time I watch TV! My mom taught my sister and I in intricate detail how to do laundry, hang it out, and iron. Thank goodness she didn’t make us iron sheets and underwear like she used to do. BTW, I always wanted the wheelbarrow in Monopoly, foreshadowing my degree in ornamental horticulture. The new cat is there to give the dog trouble, but I don’t think it’s anywhere near as cute as the dog. Thanks, Linda. That ironing demo at the fair lives vividly in my mind! Ironing underwear! That’s a first for me. They must have looked very nice in the dresser drawer. 😉 I’d completely forgotten about the dog. That must be why they chose a cat. To balance out the animal lovers. Yes, the dog (Scottie, I recall) is cuter. Lovely that you are commemorating mundane moments like ironing. So many memoirs gloss over these historic details of daily life. My earliest ironing memory involves my grandmother heating flat irons on a wood-burning stove while they were living in a cabin in the barren, god-forsaken mountains north of Las Cruces, NM. She had two or three so she could swap them around and always had a hot one. Then she got a kerosene iron. I remember hanging clothes to dry on the line and hopefully pulling the ones to be ironed off before they were quite dry, rolling and stuffing them into the plastic ironing bag. If we didn’t make it, sprinkling them with water on the kitchen counter and setting aside (hooray! that procrastination was officially sanctioned!) to dampen evenly. Sprinkling bottles for touch-ups, the wonderful innovation of steam irons, the asbestos-backed chrome iron hanger on the wall, my mother bartering time with a neighbor who did our ironing while Mother did mending and sewing in return. What a thrill wash-and-wear was about the time I married. Now I touch up plackets on shirts, and perhaps smooth pants a bit. I can do a month’s ironing in ten or twenty minutes. Thanks for this post and the memory prompt. I love how one memory leads to so many more. We’re linked together by these everyday occurrences, but we each have our unique take on them. Your grandmother having two or three irons so one was always hot and your mother bartering ironing for sewing. Those are fabulous details. Thanks for sharing your ironing memories, Sharon! Given how full our refrigerator always was, it surprises me now to think of taking up shelf space with laundry. Yet another thing I’d like to talk with my mom about. I, too, am glad I hardly ever have to iron. Thanks for dropping by, Mary. 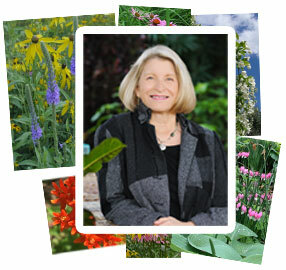 Carol, in this short piece, you have aroused memories I’d not considered in a great while. My mom used a Coke bottle, the green glass variety, with a sprinkler top on it to dampen the items to iron, then placed them in the refrigerator until ready to iron. One summer Mom and I ironed for others to make extra spending money for our vacation trip. I won’t say I enjoyed the ironing part but it does hold a special place in my heart for what it represented at the time. Today I avoid ironing at all costs! Thanks for the sweet trip down memory lane. I see in the picture that I’m holding a bottle with a sprinkler top. Were it not for the picture proof, I’d have said we didn’t have such a device. Ironing with your mom to earn money for a vacation must have made the effort feel very worthwhile. I’m glad the post evoked good memories for you, Sherrey. Darnit. the iron’s my favorite piece. Luckily they still have it on the Ipad App, or at least last time I checked. That said, I was never taught to iron so I have no memories of it. My mom bought polyester no iron clothes. Remember those in the 70’s? You are the first person to say the iron was their favorite Monopoly piece, Rachelle. Also the first to say you never learned to iron. I wonder if there is a connection? Hmmm. Oh my gosh Carol, this sounds just like my grandma! Ever since I learned how to iron in 7th grade, I have loathed the task, but I loved the memories that your homage evokes. I’m glad you enjoyed the memories, if not the ironing, Pat!